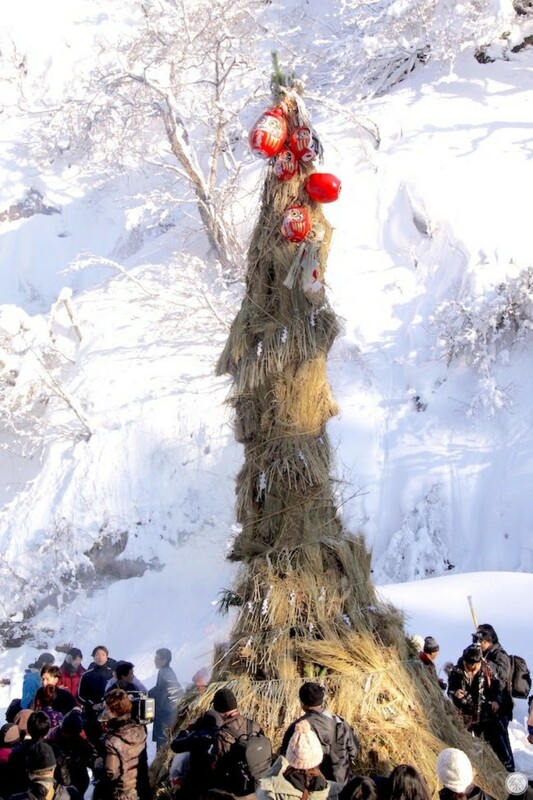 Held at Yakushido on the far end of a hot spring street of snowy Niigata Prefecture, this unique festival celebrates couples who married in the previous year by throwing the groom over a 5m tall cliff. 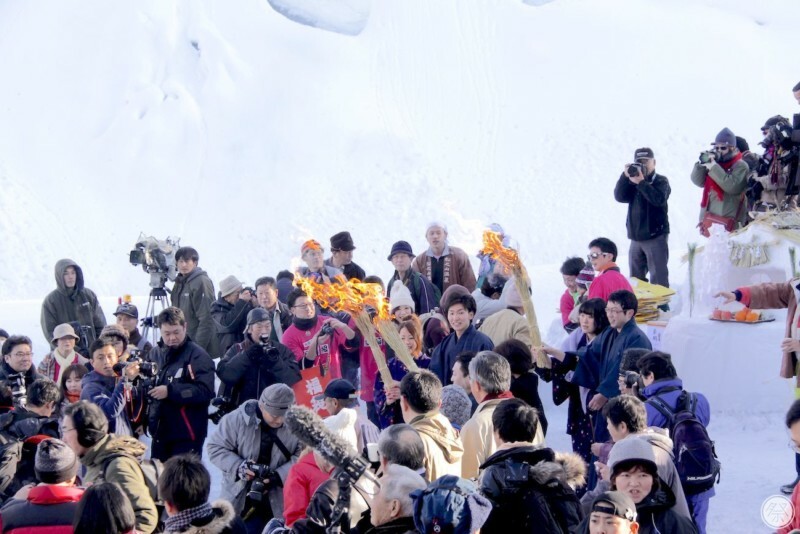 It originated as a way for locals to "spite" the young men who swept away the village daughters, but has now become a ceremony for celebrating the couple's marriage. After the groom throwing (Mukonage) is the charcoal face painting (Suminuri). After a bonfire for burning the good-luck charms from the previous year in a way of praying for a healthy year free of disasters, the remaining ash and charcoal from the fire are used by the newly weds to paint each other's face black while saying "congratulations." Others are free to participate in on the ritual, so show your celebrative vigor by painting your face black too! 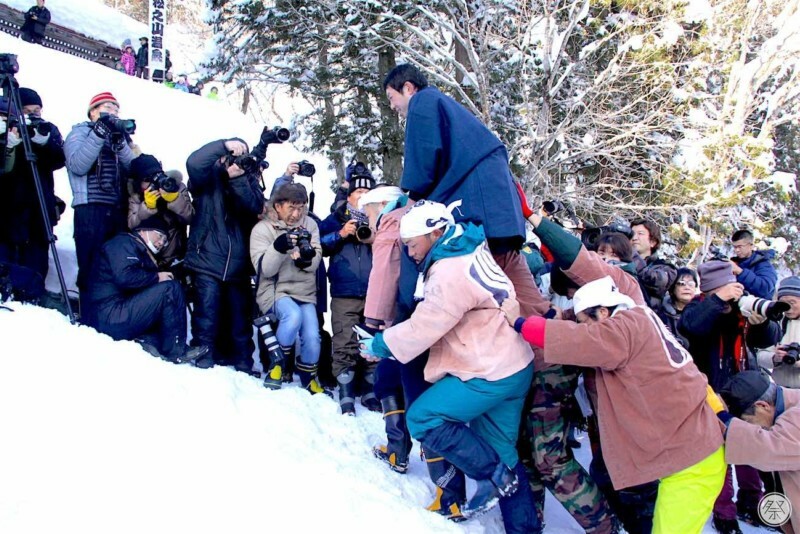 Most become worried for the safety of the groom after hearing he will be thrown off a cliff, however there is no need, as the bottom of the cliff is a soft slope heavily covered in powdery snow. The groom is able to safely arrive at the bottom where the awaiting bride stands. The bride worriedly looking up the cliff, and the groom brushing all the snow from his clothes is a heartwarming sight to see, and brings happiness to onlookers as well. Of course it all depends on the amount of snow that year, however if you make reservations as well, you might just be chosen as a groom to be thrown. After the Mukonage is the Suminuri. 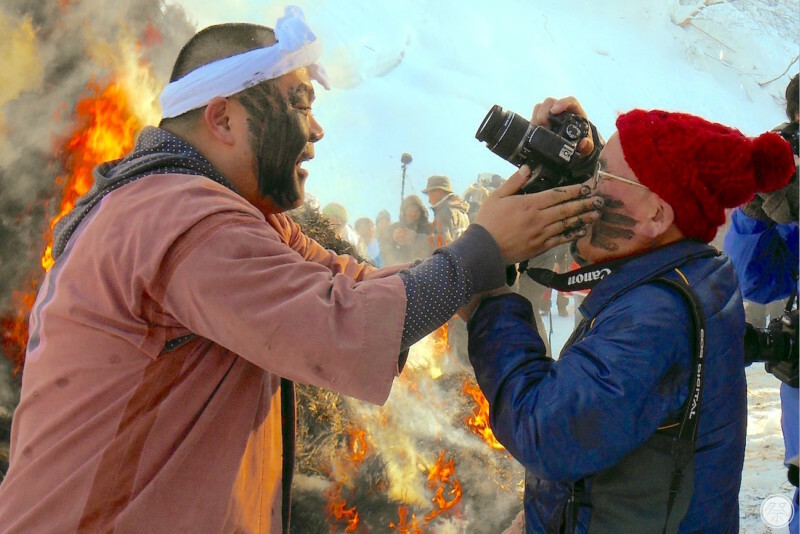 The couple mixes the black ash from the bonfire with snow and smear it all over the other's face. By doing this while giving words of congratulations, locals are able to celebrate the fact that families have grown in the mountain villages and share their celebrative feelings. The Suminuri is open for any and everyone. Join, paint your face black, and expect health and happiness in the following year. Held annually on the same date. No cancelations due to rain, however terrible weather can cause changes so please contact if you are not sure. General Participation Festival goers can also negotiate and ask to be thrown off the cliff by calling ahead of time. 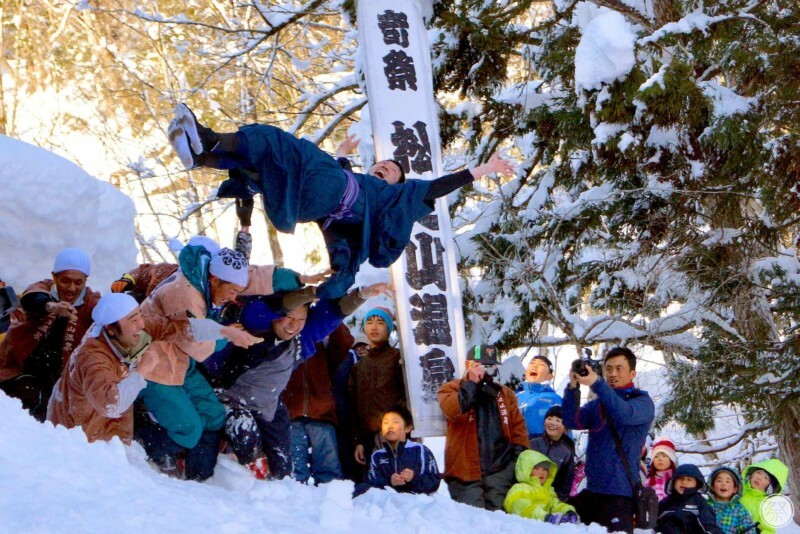 Anyone can participate in the Suminuri. International Reception and Info. Locals hand out amazake, or sweet sake, at the Okamikai held at Jiro towards the end of the hot spring main way. You can find English speakers there. Restrooms Available in two locations. The parking lot towards the front of the hot spring street and the Satoyama Visitor Center. Other useful Info. You are able to wash up and change clothes after the Suminuri at certain hot springs, so please take advantage of that. Arriving early and saving spots for photography is prohibited. If you would like to interview the participating newly weds, please contact the Tourism Association first. Please wrap your neck with a towel or take other precautions so your clothes do not become stained from the ash. Walking paths can be slippery so please wear the proper footwear. Take the Tokei Bus from Matsudai Station to the last stop at Matsunoyama Onsen. 32min ride. Costs 520 yen.